I’m not going to lower my teenage cool credentials any further than I have already by admitting that I was into planes, but I kind of was. World War II planes mostly. I’d had my share of Airfix models that looked great until the paint came out. I had huge St Michael encyclopaedias about them that came down off my bookshelf regularly and I’d pore through them, making notes on what I read and badly drawing my favourites – which reminds me, I have a fantastic aside on these to share later! And I’d dream of being a fighter pilot, at least until I was 16 and had my red / black / green / brown colourblindness well and truly confirmed by the RAF. But that was still three years away in 1985. Top Gun was still a year away too, so what on earth would make a thirteen year-old boy want to be a fighter pilot? The Harrier Jump Jet, of course! Without getting too bogged down in it, the Harrier was a fighter plane that could take off and land vertically. A bit like a helicopter, though generally it took off from a kind of ski ramp at the end of an aircraft carrier to save fuel. 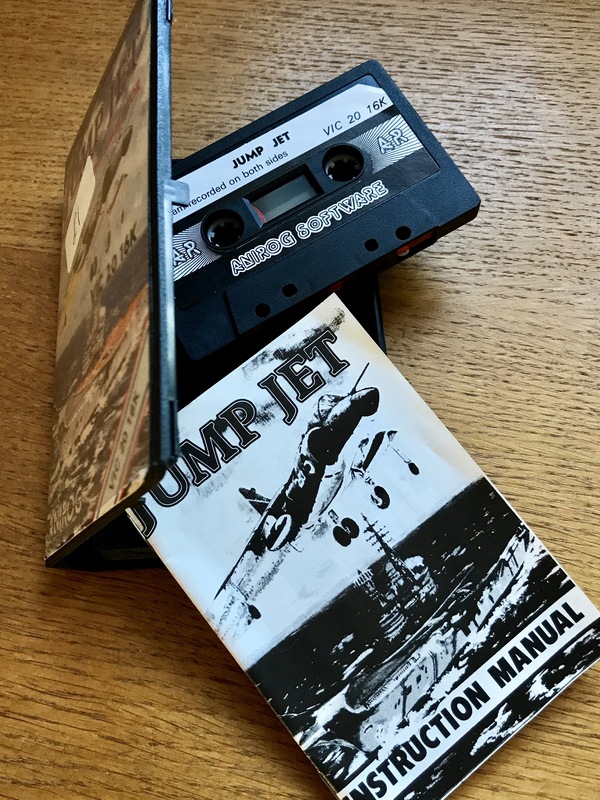 And that’s as technical and nerdy as we get in my yard; for this post at least… And in the mid-eighties, it was the coolest plane in the world – everyone knew what it was from the Falklands War build up – images of them lined up on aircraft carriers, then 20 confirmed kills, and probably a couple of Blue Peter appearances too; who needed Kelly McGillis with her incredibly hot eighties hair and little pilot sidekick when you had Christmas decorations made out of coat hangers, Sarah Greene and a sunken garden. Which is something I’d love to make an aside about but footballers have far more money than me and I’ve no chance of winning that battle! Sarah Greene though. Mmmmm. You had a map in the bottom right showing progress towards your goal – a O at the top of it – and basic controls to manage variables like fuel, height, speed and so on. The idea was to keep them all in the right ballpark for each stage of the whole flight, managing various hazards that occurred like being blown off course. If they went out of the right ballpark, the screen started flashing blue and there was a horrible alarm sound. If you corrected whatever was wrong in time, you were back on track, and if not you were screwed. No one can say this game aged well, even six months after its release, but its significance to me can’t be underestimated. I was actually flying a plane in my bedroom! That was something you only imagined doing at that time, so using that same imagination to fill in the gaps demanded by the presentation of this game was a very short stretch. I probably flew enough hours in this to get a pilot’s license! 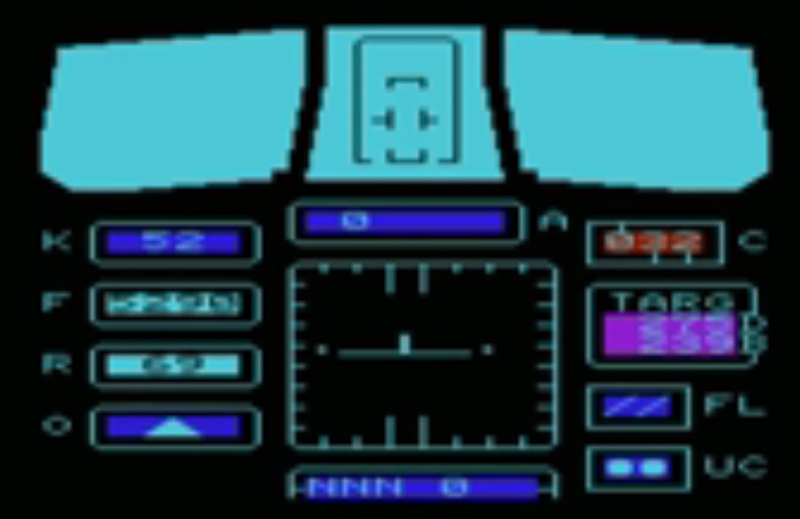 1984 would then bring Bomber Mission, complete with my first proper cockpit view! Okay, proper cockpit view was a bit of a stretch. More like view of a cockpit, as most of the time there wasn’t a lot going on outside the window. If I remember right, there was the odd appearance of a fighter plane, but what was great was the feeling of helplessness when you met flak over enemy soil (represented by a cockpit view full of flashing asterisks). 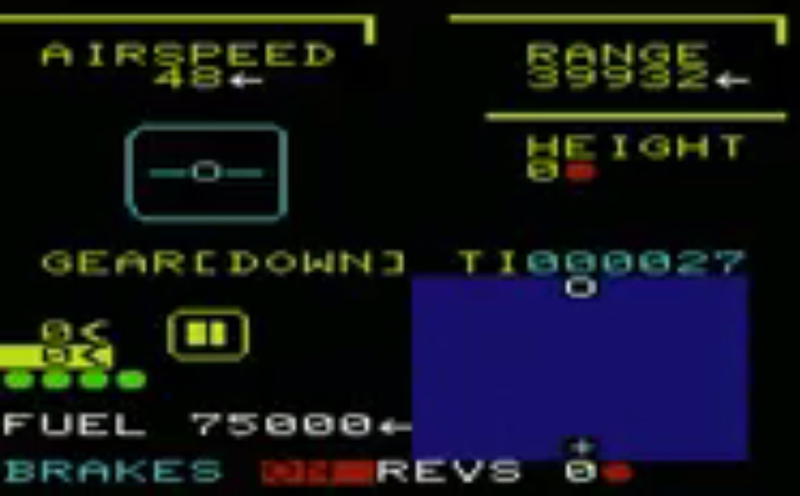 This was another groundbreaker though, because now you were really flying a plane. And it was a World War 2 bomber! You chose your target, chose your bomb, took off, navigated to the target, dropped your Tallboy then flew home and landed. And it was brilliant! Now we are in 1985, and with a 16K RAM expansion stuck up its jacksy, VIC is in its prime! 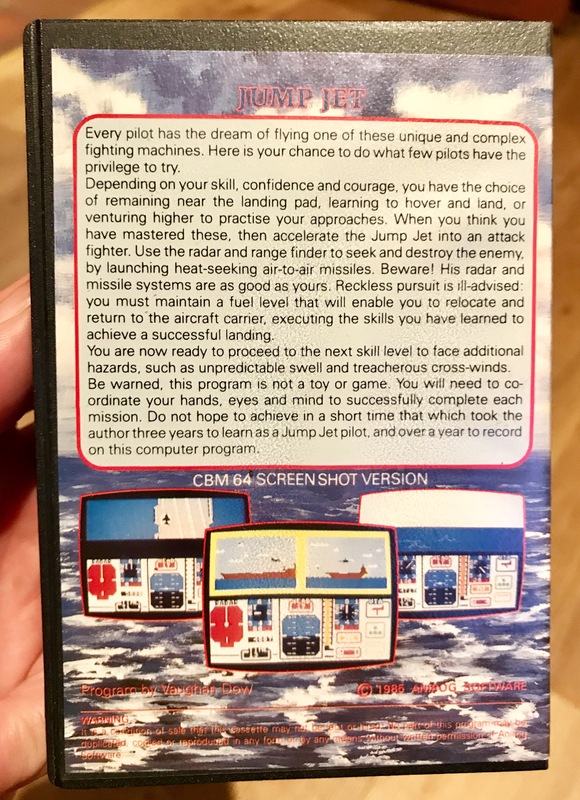 I got Jump Jet for my thirteenth birthday and looking at the back of the box couldn’t believe what I was looking at on the back of the box… From the “CBM64 screenshot version.” Oh dear, this didn’t bode well. And I genuinely remember feeling that. As I remember playing this two months later on the morning of Live Aid. But that really is going to be another story! I didn’t have too much to fear though. The VIC version held up pretty well to those screenshots. In fact, the first time I loaded it up, my black and white portable TV screen was displaying something beyond my wildest dreams! The realistic cockpit instruments. The aircraft carrier take off section. And once you got high enough, the endless blue ocean where you’d hunt the enemy in virtually lifelike splendour! But for all these control formulas you had to get exactly right in each phase of the game, once you got them you got them. 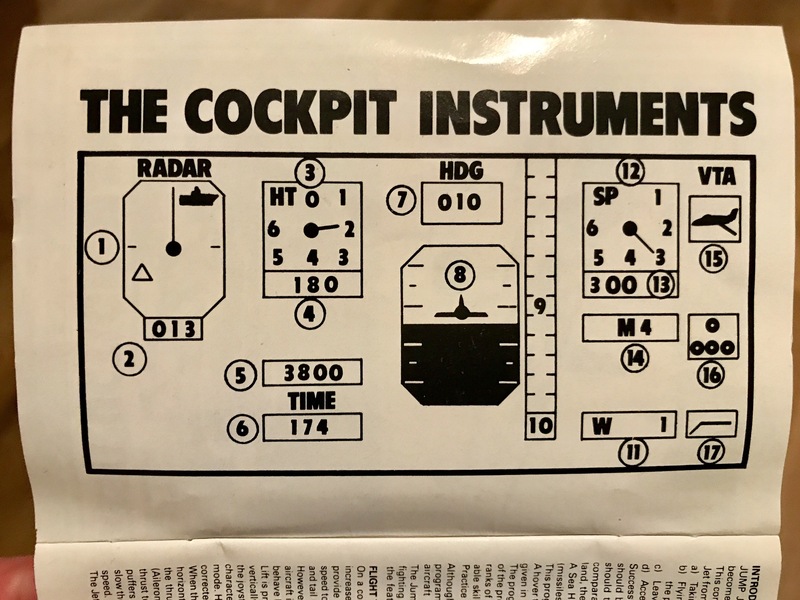 Then it became fun, and they just served to keep you alert and occupied as you trawled the skies, which was probably for the best… The instrument panel was cool, as were the various carrier views, but in reality the flight graphics were a bit plane. I mean plain. The horizon didn’t even tilt when you turned like the crappy 737 game’s did! But it was well after Live Aid that I even noticed that, and I didn’t care. There’s more to a dream coming true than a tilting horizon. Together with Pinball Wizard and Submarine Commander, this was a game I couldn’t part with when I eventually sold VIC, though it once came close after I rescued it from a school car boot sale, as the £1 sticker still on it attests to! Oh yes, I promised an aside! I dug some of my big plane books out for my ten year-old son recently, who is way too cool to show the slightest interest. 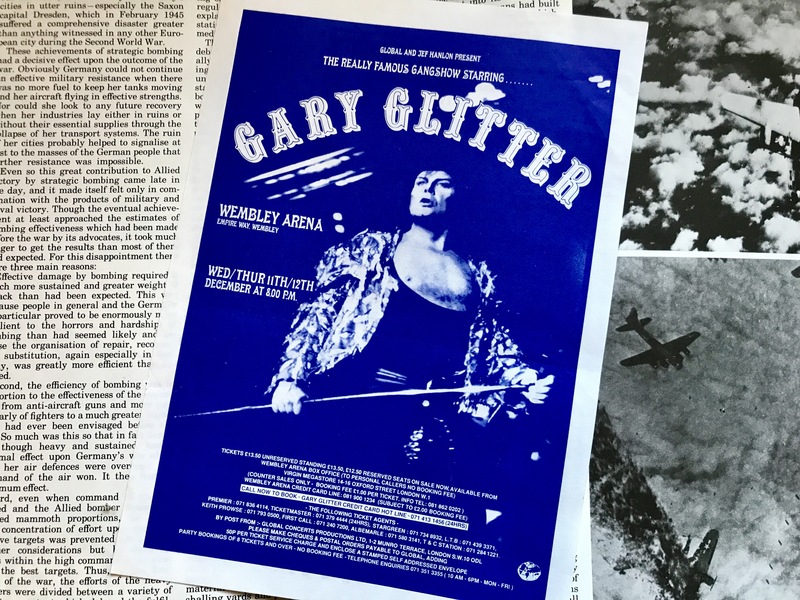 But I had an interesting flick through anyway, especially when this dropped out….